This first museum retrospective brings together seventy works that Jindrich Heisler (1914–1953) made between 1938, when he joined the Czechoslovakia Surrealist Group, and his death, in 1953. Disobeying a summons to deportation to a concentration camp in 1941, Heisler remained in hiding until the war’s end. Undeterred by the suppression of surrealism in Nazi-occupied Czechoslovakia, Heisler made much of the work in the exhibition while in hiding. In a series of photographs from 1944-1945 titled “From the Same Ilk (De la meme farine),” the moth-eaten bodies of figures form inverted silhouettes against black backdrops. Stretched into being across stark landscapes, cobwebby striations connect hand to hand, hand to face. The hues and rough textures recall Alberto Giacometti’s painted bronze sculptures. 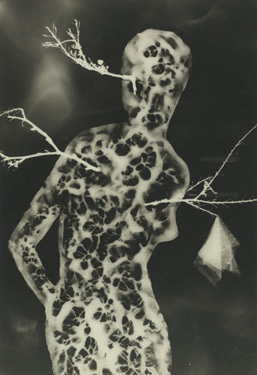 Heisler achieved these existentially wrought images through an inventive process of drawing, possibly with petroleum jelly on a glass photo plate or through image transfers, then printing the results on photosensitive paper, often applying color by hand. For his most compelling works, photomontages made in 1943-1944, Heisler staged metaphysically charged objects, such as dolls and bones, with photographs as backdrops into witty, surreal scenes he photographed. Objects take on presence. A human pelvis topped with the winding crown of a watch floats like an angel of death above a circle of jagged rocks reminiscent of Neolithic stone circles. In an uncanny juxtaposition like those made by Belgian surrealist René Magritte, a hat topped with a castle becomes a mountain. In a nod to the Marquis de Sade, who was a favored inspiration to surrealists, a work titled “Philosophy of the Boudoir” shows a gilded frame that cages a woman, her face wrapped in chains.